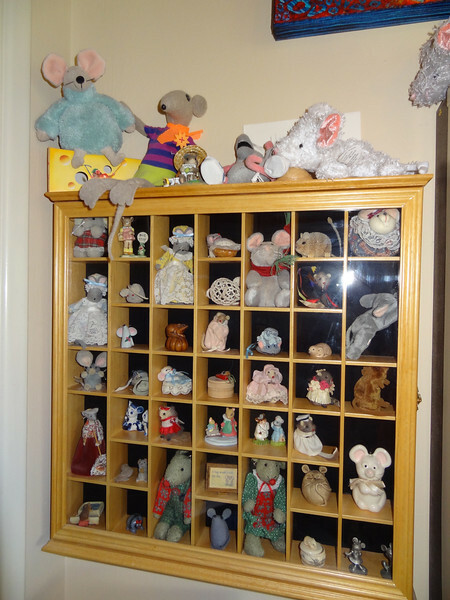 This is my mice collection, started when I was a teenager. i love finding mice, as they are so unique and not real plentiful to purchase. Most of the mice are either gifts from loved ones or ones I find on vacation as an extra special souvenir. One case is a Holiday Collection; birthday, Halloween, Christmas, Valentines day. I have a mouse house that is decorated at Christmas; both versions are in the gallery.